Tivoli World is probably the largest amusement park on the Costa del Sol. It is located in Benalmadena, 35 minutes away from Marbella. You were there? Please send us your review and grade. We would love to hear from your family! An amusement park surrounded by beautiful fountains and gardens, where you'll enjoy classical rides together with modern ingenious last generation rides. Each family member will experience their own adventure. How to get there: Take the Mediterráneo highway A-7 direction Malaga, exit 222. Location is 5 minutes walking from the Arroyo de la Miel Railway Station. Price: 7 euros per person (1+ meter tall) or 10 euros for a supertivolino ticket (free access without limits to most attractions). Hours: Open in July from 5:00pm - 1:00am, August from 6:00pm - 2:00am. Check schedule for other opening days and hours. Closed in December. Tickets: Order tickets online for a discount and avoid lines. Son's evaluation: I like Tivoli World because it has a variety of different attractions. I recommend you to try the water log ride. You can eat and drink, and buy some souvenirs. Although some rides can be scary. Mom's evaluation: Don't expect this amusement park to be on the same caliber as Disneyland. However, it was still a fun way to spend the day with the kids on outdated rides. Mom Now (fall), the Tivoli World is only open in the weekends, with an exception of Monday the 11th of October. They are having a Halloween special this month with scary rides, and if you come dressed out you will get a free ice-cream. There is also a German Sausage Festival, and with your entry you get one free sausage and drink! The entrance to the park was 7 € per person, and then we bought the Supertivoli bracelets, 10 euro, for the kids and that worked out very well for us. We were quite lucky in the sense that my son (taller than 110 cm) could go on most of the rides, and my daughter (less than 140 cm) could go on the same rides as her smaller siblings. So, we got to stay together as a family the whole day long and the kids had lots of fun. Family day for kids between the age of 5 and 9, or between the height of 110 cm - 140 cm. With the bracelets they could go on the rides over and over and over and over again, and us as parents just had to bring lots of patience and sit down and watch them. For the rides where you needed to be taller than 140, an adult could accompany the child, so I bought some tickets for those rides. Most of them you needed two ticket for, so 2 €. 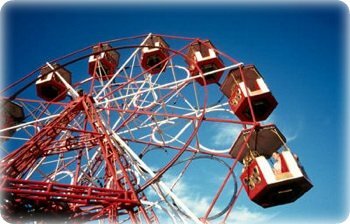 The next time though, my husband and I will also buy the bracelets, as the kids then can go on the bigger rides and we can join in on the fun! So, you can say that the entrance fee pr. person is 17 euro. It was a great day to go there as the weather was not too warm and there was not too many people, so the kids did not have to wait in line for a long time. Keep in mind though that some of the rides are closed over winter for maintnance reasons. Girl (12 yrs): We had a great night there recently - bought an all inclusive wrist band for our gran daughter and then tickets at 2 euro each for the few rides we had to go on with her. NOTE:- The boats in this picture and the little pony rides etc are an extra 4.50 euro as not included in the Tivolino. (There are about 9 rides for under 1.10 mts in height). Girl (9 yrs): I gave a 10 to tivoli world because there are lots of attractions that you can ride on, for little children as well as for parents. There are also some restaurants to eat there if you do not want to go to your house again to eat there and then come again.